Submitted for your Pumpkin-Day viewing is the painting I did for last year's Halloween issue of SpongeBob SquarePants Magazine...a special Halloween themed portrait of SpongeBob and Patrick as seen from inside a Jack-o-Lantern pumpkin. Painter Norman Saunders shares some goodies, too! Next chapter: The Monster’s Cave! The last time I wrote about Gold Key comics, I talked about the huge contrast between the gorgeous painted covers and the often-boring-as-cardboard interiors. Although a LOT of great stuff appeared in the Gold Key line, it's a lot of work to find the treasures among the drek. Next Chapter: Death From The Sun! Welcome to the first chapter of an epic funny animal adventure from 1945's Taffy Comics #1, starring Wiggles the Wonderworm. This comic was produced by L. B. Cole and published by Rural Home/Orbit Publications. Click on any of the pages to open up a BIG comic books scan! I haven't seen the movie, but what I really liked about this article was the interview with Storyboard Artist Federico D’Alessandro. He talks about the creative process of drawing storyboards while on the set of the movie, and about his creative interactions with the director Spike Jonze. D’Alessandro ends the interview with some good advice on what it takes to get a job as a storyboard artist -- as you would expect, there's no magic formula, but at least he's candid and realistic about the job prospects. The scans are good quality, and when you click on the comic pages you get to look at a nice big scan that's easy to read. Classy stuff all the way. 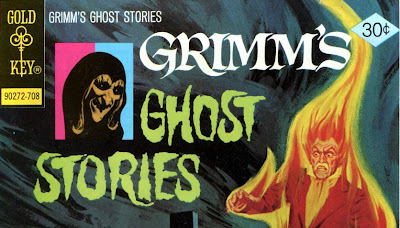 Make sure to bookmark The Big Blog of Kids' Comics 'cause you'll want to come back to it often. Thanks, Mykal! Obscure Funny Animal Comics Department: Meet Wiggles the Wonderworm from L.B. Cole’s 1945 Taffy Comics…Published by Rural Home/Orbit Publications. Wartime comics often had superheroes battling the Axis powers, but I’ve never seen anything like this image of Wonderworm fighting a Hitler-Spider! 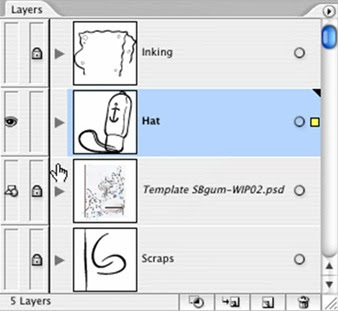 Adobe Illustrator Cartoon Inking Tutorials - Now in ONE Convenient Playlist! 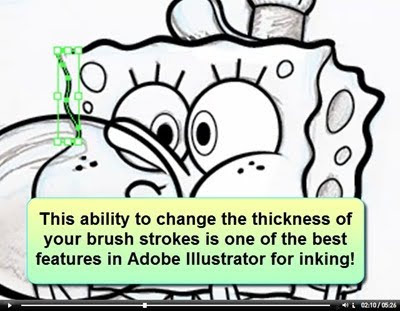 The Adobe Illustrator Cartoon Inking tutorials I created a few months ago have been a big hit on YouTube...thanks to everybody that left comments and ratings! #4 - We Start INKING in Illustrator! Because of the way that Illustrator is usually taught, a lot of people have no idea that you can do beautiful freehand cartoon inking with the freehand brush tool in Adobe Illustrator. If you want to quickly learn to do digital cartoon inking in Illustrator, you're gonnna love these videos. Here’s one of the delicious background paintings from the show…reminiscent of the semi-abstract science fiction paperback paintings by Richard Powers. These were painted by master designer Nick Jennings! Lots of funky character designs by Craig McCracken, Thaddeus Couldron and of course Derek Drymon! This stuff is only a tiny sample of the cartoon bounty over at Derek’s new Danger Planet Blog…go on over and take a look, and then call up Cartoon Network and tell ‘em we want more Danger Planet!